VOCs are naturally found in many building materials and home products, including hardwood floors. It’s important to know that VOCs are organic compounds and can be found naturally, but can change quickly and turn harmful. What makes some organic compounds potentially dangerous is their ability to quickly turn into vapor or gas. These types of organic compounds are VOCs, volatile compounds. Once these compounds turn into vapors or gas, they create indoor air pollution and cause the unhealthy side effects we’ve all heard about. VOCs can be found in a couple of things in your home, including building materials and everyday household products. Volatile organic compounds are found in adhesives, air fresheners, fabrics, paint, markers and many cleaners. But don’t panic! Look for these products labeled as “low VOC” or “no VOC”. Different certifying organizations typically approve these products before they can be sold as safe. Learn more about the labeling of products relating to indoor air quality and volatile organic compounds from the EPA, here. Tesoro Woods offers certified No VOC and Low VOC hardwood flooring products. All products have been certified by a third party and meet FloorScore® indoor air quality standard for hard surface flooring materials and adhesives. See our Environmental Attribute Guide for all Tesoro Woods’ product certifications. Additional information is available upon request. All Low-VOC products emit less than 0.005ppm (parts per million) volatile organic compound chemicals. All certified No-VOC products emit less than 0.001ppm (parts per million) volatile organic compound chemicals. 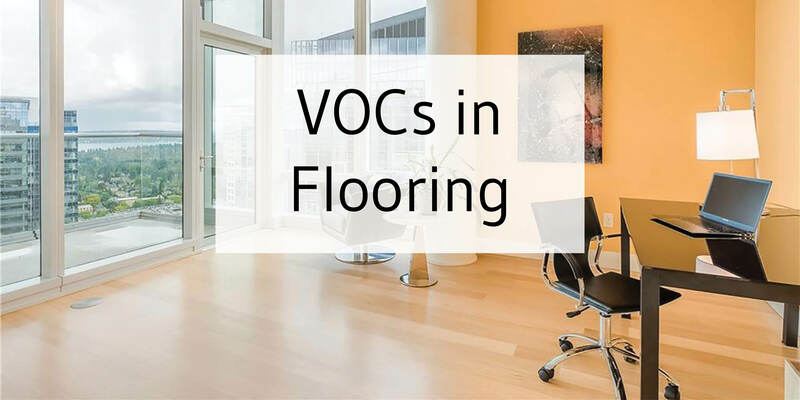 Now what we know they are, how do VOCs relate to wood flooring? Really, it’s the adhesives used in laminate and engineered flooring that can off-gas volatile organic compounds. Tesoro Woods uses some of the safest glues available today – they’re about as harmful as Elmer’s white glue! Because of the adhesives, formaldehyde is one of the most common VOCs in flooring. All no added urea-formaldehyde engineered wood flooring products contain no – less than 0.001ppm (parts per million) – added urea-formaldehyde in the glues. Tesoro Woods uses a newly developed two-part, EPI glue system that contains no added urea-formaldehyde. Formaldehyde is natural, it occurs naturally in almost everything. Common products that emit formaldehyde have adhesives that bind different layers. Engineered flooring, laminate flooring, insulation, varnishes and certain upholstery all contain adhesives that emit formaldehyde. When buying products that are known to emit formaldehyde, check if the products are certified and are made with certified resins. Tesoro Woods offers certified No Added Urea Formaldehyde products. All products have been certified by a third party and meet FloorScore® indoor air quality standard for hard surface flooring materials and adhesives. Our products are well below California’s strict formaldehyde emissions standards for engineered hardwood flooring. Remember, all of Tesoro Woods’ no added urea-formaldehyde engineered wood flooring products contain less than 0.001ppm added urea-formaldehyde in the glues. See our Environmental Attribute Guide for all Tesoro Woods’ product certifications. Additional information is available upon request.